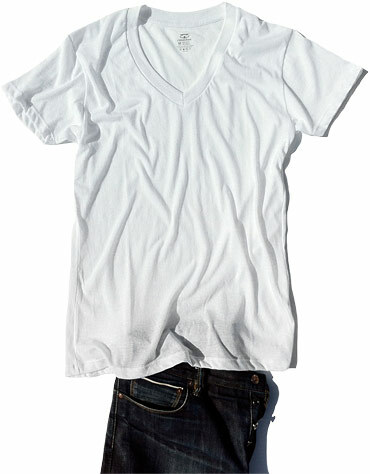 In the summer, a good undershirt is one of your first lines of defense against sweat stains. It's also a last resort, allowing you to strip out of your top shirt when things get really hot. The key is finding the right one. You don't want a thick, bulky undershirt. Nor do you want a crew neck peeking out from under your collar. Look for a thin V-neck with trim sleeves and a hem that stays tucked in. Herewith, a few other things to keep in mind. Growing up in South Louisiana, my father made me wear undershirts anytime we were going some place nice—he swore that it made you cooler. A thin cotton layer will actually wick the sweat from your skin, which helps regulate body temperature. Plus, the fibers do create very small pockets of air—just enough to cool the skin slightly. For days when your undershirt is swampy by the end of work, keep a spare (or two) at the office. Change just before you head out and it'll feel as if you've showered. Based on a vintage poly-cotton Towncraft undershirt, these are thin and breathable, yet substantial enough not to lose their shape and long enough to stay tucked in. Made in the US from a soft, loose knit 50/50 jersey material, the breezy featherweight shirt feels like an old favorite you've had for years. When wearing a lighter top shirt, a grey V-neck won't show through as much because it doesn't reflect as much light as a traditional white one.